InterCoastal Net Designs values our longtime customers. We take time to review our clients websites and make suggestions to keep their online presence modern and effective. Bob Williams Realty of the Ocean Isle Beach and Brunswick Beaches area is a prime example of this with having recently undergone a MLS 3D upgrade. 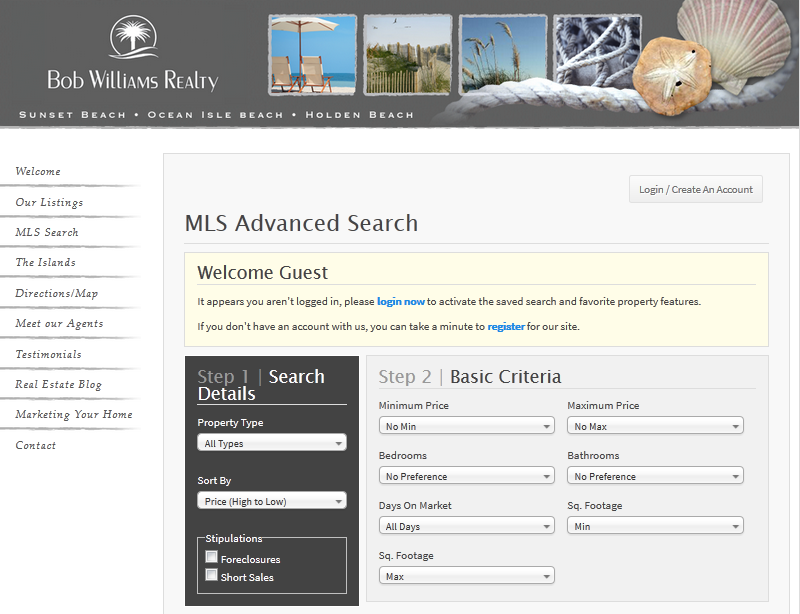 Our MLS 3D product is an updated version of our MLS integrations that many clients have on their sites. MLS 3D features a sleek and user-friendly interface, hopefully allowing potential clients to search with ease and eventually purchase or book a property. The ICND team also completed a few Content Management System updates with the addition of our Lead Tracker. This allows the real estate agent to capture leads, properly manage the leads and hopefully convert them into a sale! Other fabulous Lead Tracker features automated email responses, customizable reports, round robin lead assignments and records of all correspondence. InterCoastal Net Designs strives to help give our clients a boost and we’re excited about the functionality updates complete on the Bob Williams Realty site. If you’re feeling like it’s time to give your website a boost – contact us today!